If you look at your WordPress site and decide that trying to modify it will take longer than simply starting over, then the BoldGrid option for resetting your site will save you time and frustration. Fortunately, the “Starting over in BoldGrid” option is available in the Administrator settings — to make restarting easy. 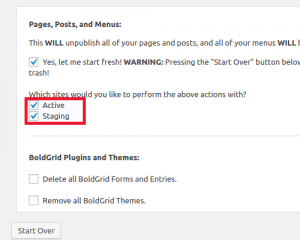 The restart options provided by the BoldGrid plugin let you be selective in how you start over. You can also simply decide to wipe everything out so that it looks like you just loaded the plugin for the first time. 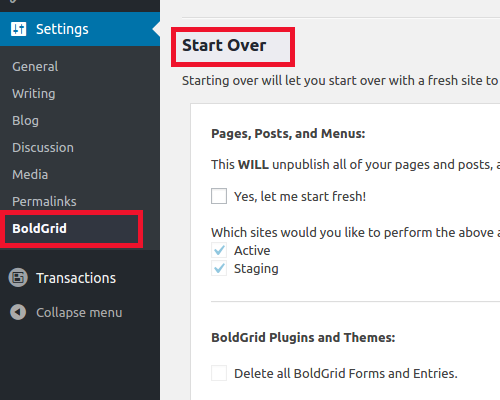 This tutorial will walk you through the process of resetting BoldGrid so that you can start fresh. 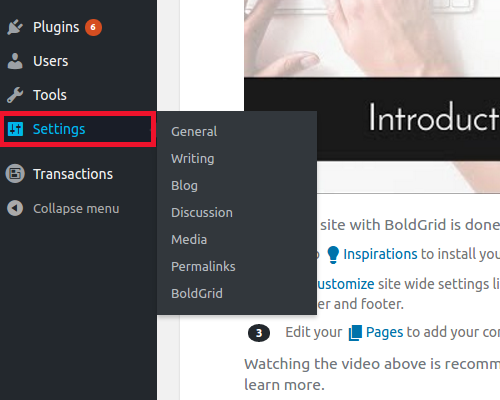 Log in to the BoldGrid administrator dashboard, then click on Settings in the menu at left. 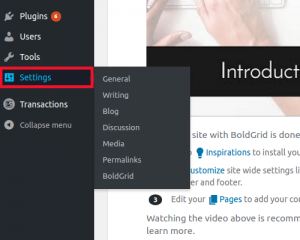 Click on BoldGrid, then scroll down until you see the section labeled Start Over. Select Yes, let me start fresh! 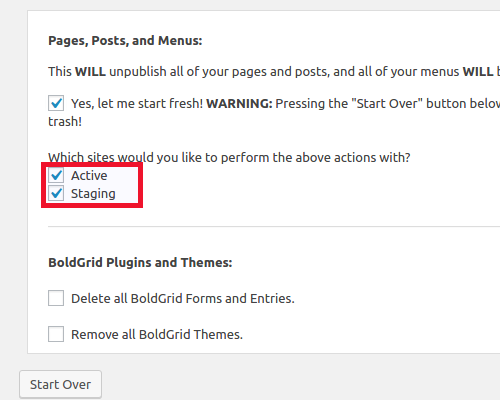 You can select to reset either Active, Staging, or both sites. By default, both sites are selected. 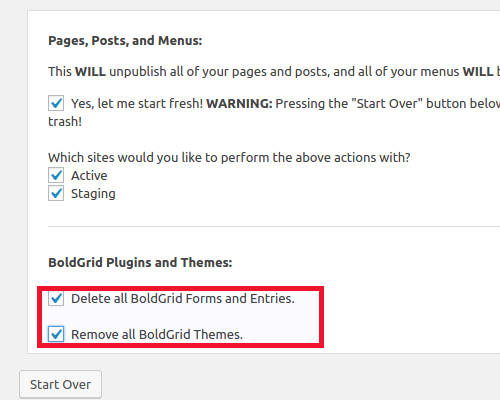 Click on a check box to remove a particular site. 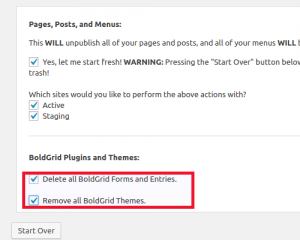 BoldGrid also includes forms and themes. If you wish to remove either, then click on the checkbox for each. WARNING: There is no confirmation stage when you click on the Start Over button. It immediately begins the restart process. Make sure that you are ready to reset everything before you click the button. When you have finished specifying how you wish to start over, click on Start Over. When you go back into the dashboard, any existing site will have been removed based on your chosen restart settings. You will need to select a new Inspiration for your WordPress site. Note that you will not be able to start over if you do not have an Inspiration loaded. 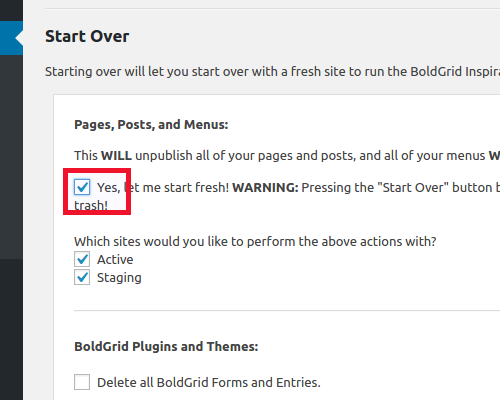 And, remember, starting over in BoldGrid can erase your site completely, so it is well advised to use this option carefully.